When it comes to holiday dinners, I tend to pass on the pumpkin pie. Yet, if sweet potato pie is involved, well, that’s a whole ‘nother story. Around here, the sweet potatoes always end up as a side. Not that there’s anything wrong with that. But wouldn’t it be nice if for a change sweet potatoes could make an appearance at dessert? That’s where this pie comes in. So when the #SundaySupper crew floated the idea of a #BakeForACure event to raise cancer awareness and then when Chantal offered to sponsor, generously providing a number of us with its new “Easy As Pie” dish, well, that was all the incentive I needed to create this special dessert. As I’m sure you know, October is National Breast Cancer Awareness month. Isabel at FamilyFoodie.com and founder of the Sunday Supper Movement suggested for this #SundaySupper we bake something special to give back to our local communities. In the process, we’re hoping to raise awareness of all types of cancer through our blogs. To that end, my long time friend, DeAnne, for some time has been telling me about a member of her church who is suffering from blood cancer. As of this writing, he has successfully undergone a bone marrow transplant and is in the process of healing. To help his family, the Deacons at the Seventh Avenue Presbyterian Church here in San Francisco are coordinating a “Meals for Mark” program to help provide food and general household supplies. This pie (as well as some other goodies) will be going to Mark. Truth be told, I’ve been mulling over this pie since last Thanksgiving when I first served Saveur’s Sweet Potato Casserole with Pecan Crumble. It was such a huge hit with my family and friends, that I ended up making it several times between Thanksgiving and the end of the year. We all thought it could easily be a dessert too, and converting it into pie was a breeze. After a bit of tweaking, all I needed was the perfect crust, which led to this cookie crust made of crushed Gingersnaps and pecans. Wait until my family sees what I’ve done! By the way, did you know that the sweet potato is not related to the ordinary potato at all but is a member of the convolvulus and morning glory family? These tubers even predate their rounder, white namesake. To make matters more confusing, here in the U.S., a yam is not a yam but a sweet potato. 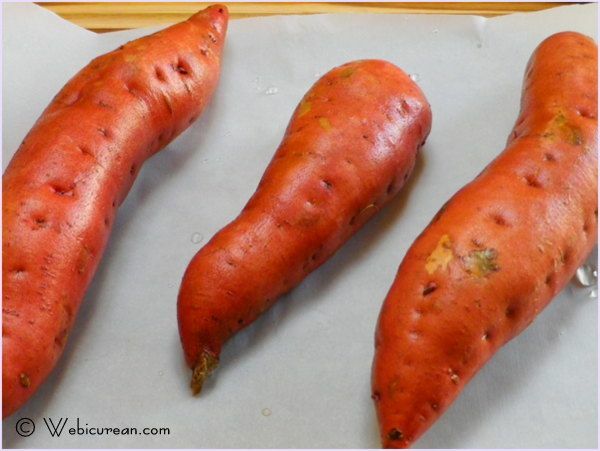 And for this recipe, I chose garnet yams, both for their flavor and deeper color. There was a time when the sweet potato was thought to possess aphrodisiac qualities, which John Gerard in 1597 said the potato “comforts, strengthens, and nourishes the body,” as well as “procuring bodily lust.” But don’t let their lustiness fool you, sweet potatoes are packed with nutrients such as beta carotene, Vitamin A, Vitamin C, antioxidants, and hold many other nutritional benefits. Before we get into the step-by-step instructions, I’d like to thank Chantal for providing the pie dishes for this event. The “Easy As Pie” dish I received is a gorgeous deep red, and pretty enough to go straight from the oven to the table. I also love that the fluted edge is meant to be a mold to help flute the crust. While I didn’t take advantage of that feature with this recipe, I have no doubt I will in the future. The lip around the border helps ensure your pie doesn’t bubble over in the oven. As a special thank you to our readers, Chantal is running an online promotion during the #BakeForACure event–20% off all Chantal pie dishes. To redeem your coupon, simply go to www.chantal.com, select the pie dish(es) of your liking, then enter discount coupon code “BAKE4CURE” at checkout. This will give you 20% OFF of ALL Chantal pie dishes on www.chantal.com. This coupon discount code is active October 16, 2012 through October 30, 2012. Be sure to read this recipe through before starting. First, let’s preheat that oven to 425F, so we can get the sweet potatoes baking. Wash the sweet potatoes, place them on a cookie sheet lined with parchment paper, and bake for about an hour (or until done). Let these cool about 30 minutes. While these are cooling, let’s get the crust ready. 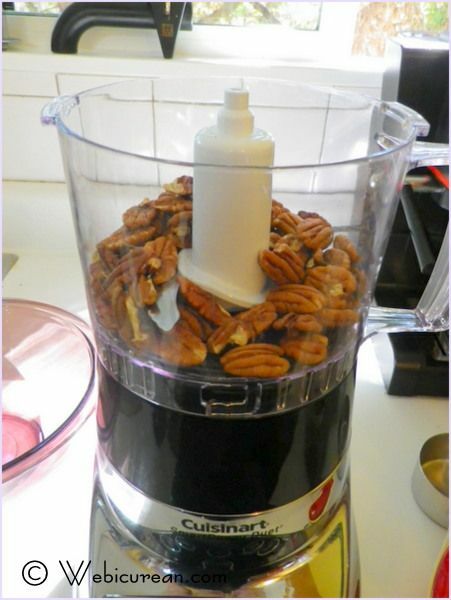 Grind pecans in a food processor, set aside in a medium sized bowl. 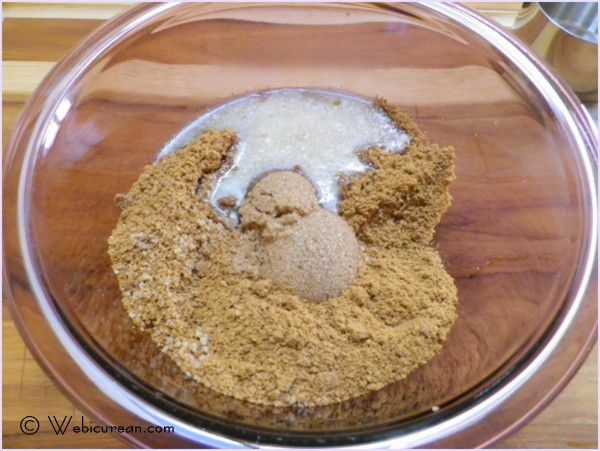 Grind Gingersnaps in a food processor, and add to the bowl with the pecans. Add brown sugar, salt and melted butter. Stir until all dry ingredients are completely moistened. Press the cookie crumb-pecan mixture into the pie dish–the backside of a measuring cup can help even this out. The potatoes should be cool enough to handle by now, so let’s puree those. If you have a food mill, now’s the time to break that bad boy out! If not, a regular ol’ food processor is fine. 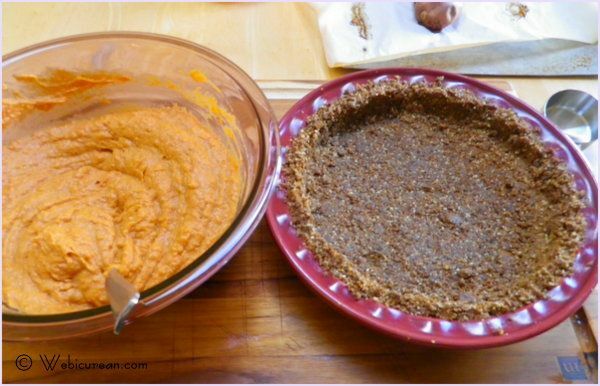 In a large bowl, combine by hand the sweet potato puree with all the other ingredients for the filling. Once blended, spread filling mixture evenly in the pie crust. 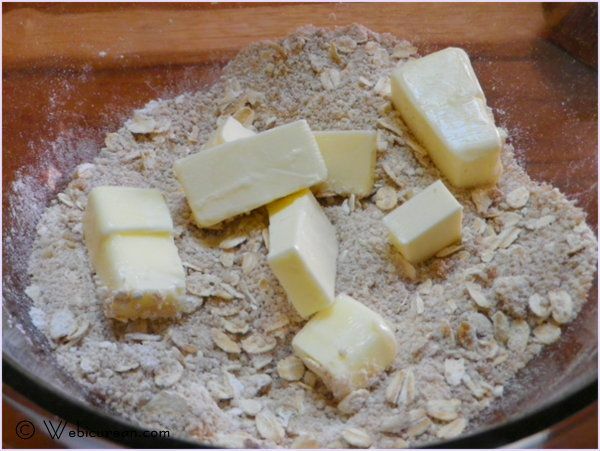 In a small bowl, combine the dry ingredients for the crumble mixture. Add the butter, and rub into the dry mixture with your hands until the butter is worked through. Dot top of pie evenly with crumble mixture, and bake in a 350F oven for 40 minutes. And serve yourself a big fat piece! 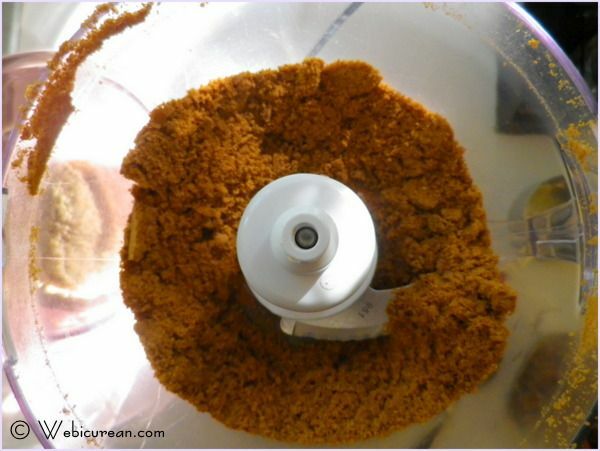 Add the cookies to a food processor, and pulse until completely ground. Add to a medium bowl and set aside. Grind the pecans in the food processor and add to the cookie crumbs in the bowl. Add the dark brown sugar, salt, and butter, and stir until all dry ingredients are completely moistened. Press crumb mixture into a pie dish to form crust. 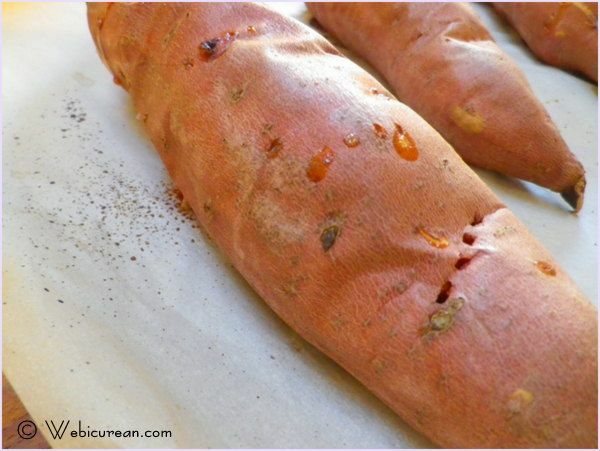 Wash sweet potatoes, and place on a cookie sheet lined with parchment paper. Bake for about an hour at 425F or until done. Remove from oven and cool for about 30 minutes. 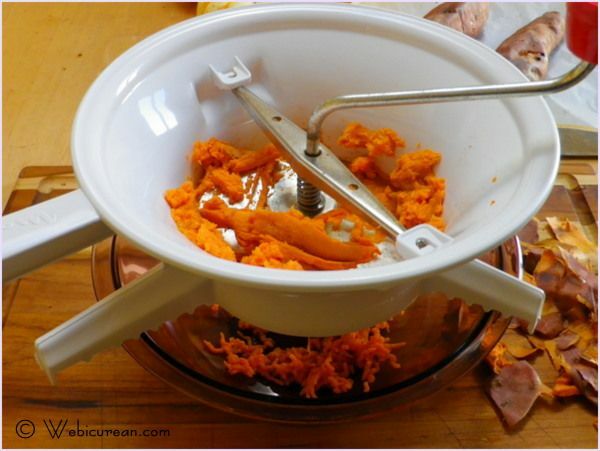 Peel the potatoes and run through a food mill into a large bowl. Add the remaining filling ingredients to the bowl and stir until completely combined. Add the butter, and rub into the dry mixture until crumb mixture forms. Sprinkle this evenly over the pie filling, and bake in a 350F oven for 40 minutes. These #SundaySupper contributors, were provided with a beautiful Easy As Pie Dishby Chantal Cookware. Â They will be sharing their recipes with you this Sunday and also their thoughts on this Beautiful Pie Dish. Â Many are giving away their dish along with their pie to brighten someoneâ€™s day. Check out these additional #SundaySupper recipes, perfect to take to someone who you want to make feel special this month. 10 Grain MuffinsÂ by Mangiamo! Gluten-Free Carrot Cake DoughnutsÂ by What Smells So Good? Do you want to get your own Easy as Pie Dish? Â Chantal is offering Â willÂ be 20% OFF of ALL Chantal Pie dishes onÂ www.chantal.com. BAKE4CURE must be entered at checkout to receive the pie dish discount. The coupon discount code is active October 16, 2012 through October 30, 2012. Join us on Twitter throughout the day during #SundaySupper. 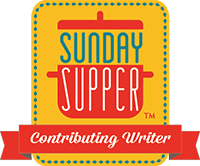 Â Weâ€™ll be meeting up at 7:00 pm (Eastern)Â for our weekly #SundaySupperÂ live chat. Weâ€™d also love to feature your easy go to recipes on ourÂ #SundaySupperÂ Pinterest boardÂ and share them with all of our followers, too. Keep up with the latest from Chantal on theirÂ website,Â twitter,Â facebook, andÂ PinterestÂ ! Sweet potato pie is on my bucket list. It sounds so incredible with a crumble! Here they are red on the outside but yellowish white on the inside, no orange ones at all! Beautiful pie! My 10-year-old nephew is a sweet potato casserole fiend (no marshmallows). He would absolutely love this pie! Brilliant to make the crust out of gingersnaps. This recipe sounds perfect for the holidays! 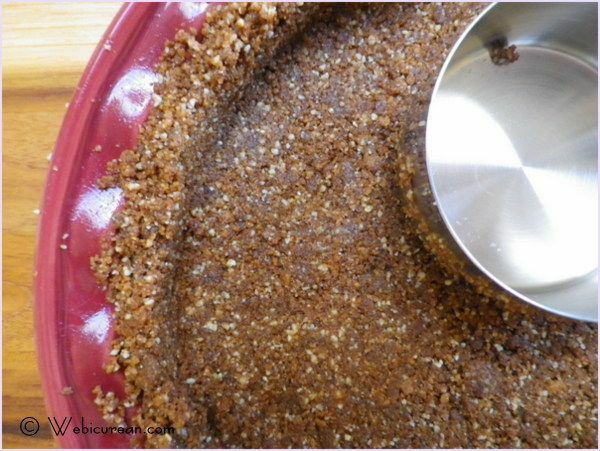 I love the idea of a gingersnap pecan crust – YUM!!! You basically just made my boyfriend’s day with this recipe. He walked by as I was reading it and stopped to see haha. Biggest sweet potato fan ever. Why, yes, I’ll take a great big piece of this pie, please and thank you! Pecans and gingersnaps in it too – oh my! Wonderful. So wonderful of you to send out such an amazing pie! I love sweet potato pie and need to try it with pecan crust! 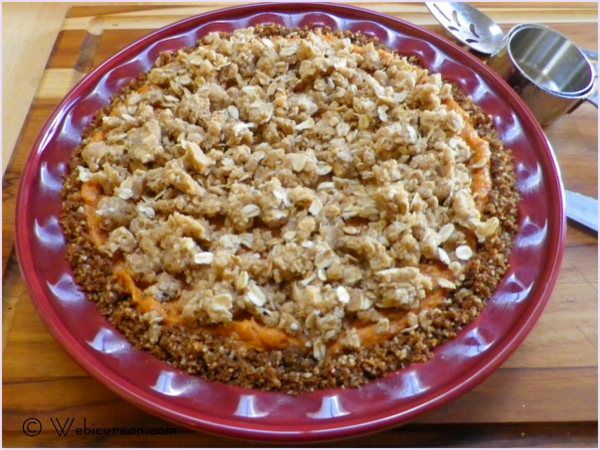 Sweet potato is my favorite pie, and you just took it to a whole ‘nother level! YUM! 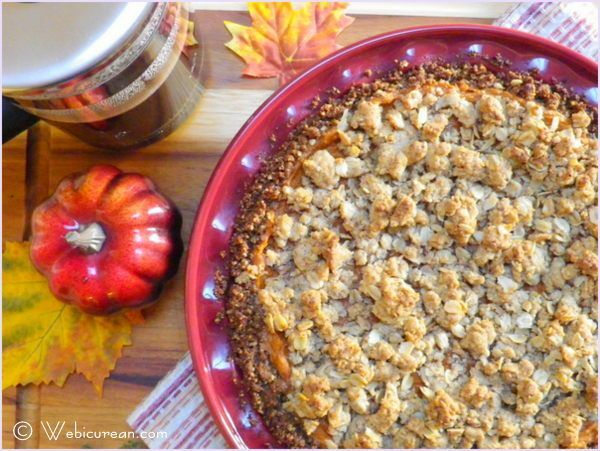 Jen @JuanitasCocina recently posted..Pumpkin Pie with Pecan Streusel Topping ~ #BakeForACure #SundaySupper with Chantal! I tend to pass on the pumpkin pie myself. This looks delish! Great photos! 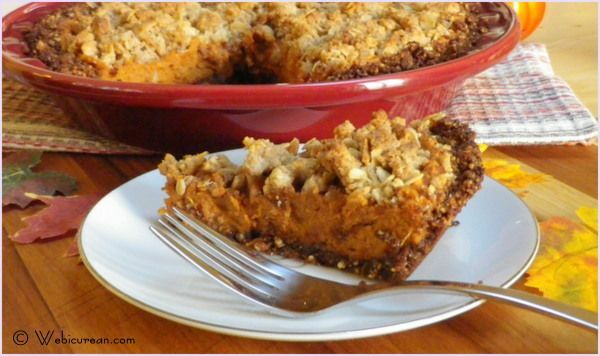 I love sweet potato pie and I love gingersnaps, this sounds like the perfect pie to me! Wow! That is blue-ribbon worthy! I made a sweet potato pie yesterday for a pie contest. Now I wish I had put your crumble on top! Mmmmm….I”m so glad you converted this yummy recipe into a pie! Mark’s family will be delighted with your support as well as this amazing dessert. Happy #SundaySupper! Beautiful pie!!! I will be making this for Thanksgiving in my chatal dish 🙂 Although I know mine will not be anywhere as pretty as yours! Oh my goodness, this pie looks gorgeous! I’ve never had sweet potato in a pie before but why the heck not? The sweet, creamy sweet potato filling is a perfect compliment to that amazing gingersnap crust. I’m wishing Mark and his family all the best – I’m sure they will love this pie! Well now I know what I’m bringing to Thanksgiving! My mom will go ga-ga over this pie-it’s beautiful and sounds amazing. The hubbie is going to love this pie. I am sure Mark will love it! 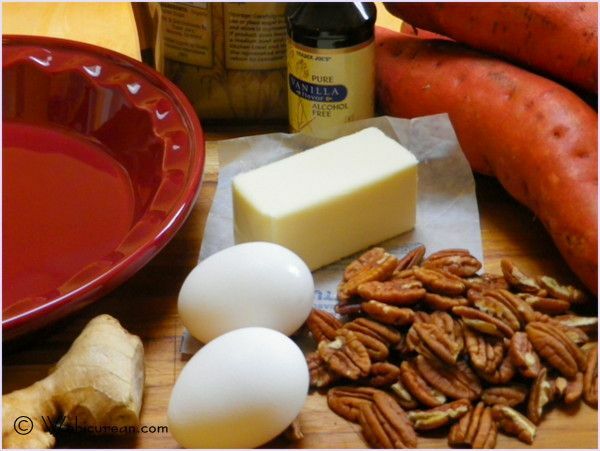 Sweet potatoes are so good – one of my absolute favorite. Unfortunately my husband is not so much of a fan…but he loves pecans 🙂 It sounds like an amazing recipe. Thank you for sharing. Soo Good! a must try. I love eating sweet potato fries, but I cannot remember if I’ve ever had sweet potato pie. 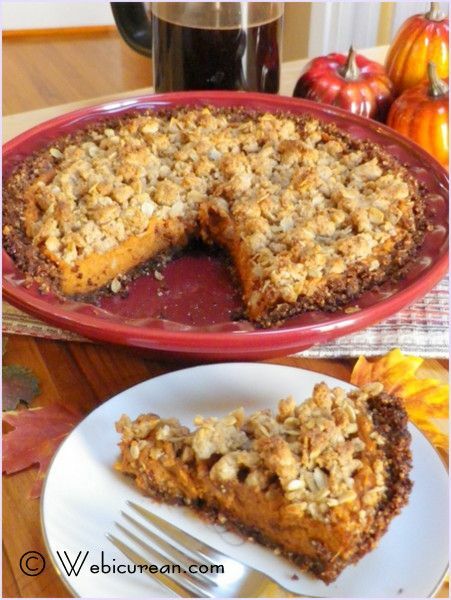 I rarely eat pie, so the answer is probably no haha I do love the idea of a gingersnap pecan crust, so I’m pinning this! Wow! This is one beautiful and drool-worthy pie. I can’t wait to try this recipe for Thanksgiving. My grandfather is gonna love it. Pinned. I’m so happy to hear that this pie went to Mark. That was such a wonderful and kind gesture. And I am also sooo very glad you have made this pie into a dessert. It sounds divine and amazing at the same time. Wish I can have some right now. What a gorgeous pie. My uncle will love this on Thanksgiving! I could never get into sweet potato pie, but your recipe looks so amazing, that I might just have to give it a try to change my mind! Wow! That pie looks really, really good! I can just imagine all those flavors together. Mmmmm! The whole pie looks wonderful, but that crust looks amazing! It was so great meeting you this weekend at the Food Buzz Festival! This pie looks delish! I think it’s time to start baking! Just wanted to drop you a note to say hi. I’m looking forward to more of your posts! Thanks, Noelle! It was great meeting you too! I tried to subscribe by email to your blog the other day, but I think your captcha is broken–the image is super clear, but I keep getting a message that I typed the wrong letters. I just tried again now, and got the same error. PS I want to try your skinny artichoke dip this holiday season (to replace my not-so-skinny one)! Wow! This looks like a MUST MAKE for Thanksgiving! I will be making this for sure. Thank you for sharing this beautiful recipe! Sweet potatoes are more popular ingredient in sweets than pumpkin in Japan. I grew up eating lots of sweet potato pies and desserts and this looks wonderful!! I already commented on this post, but I had to come back to say Congrats for making the top 9 today! Well deserved! LOL thanks! I was so surprised! In a large bowl, combine by hand the pumpkin puree with all the other ingredients for the filling. Once blended, spread filling mixture evenly in the pie crust. Is there pumpkin in this also or is this just error. whooops no! that’s a typo. I must have had pumpkin on the brain. I’ll fix that right now–thanks for catching! I plan on making sweet potato pie for Thanksgiving and I LOVE that this recipe uses gingersnap for the crust! Your directions say to use 2lbs of sweet potatoes, about how many sweet potatoes would this be? Or how many cups once mashed? Sorry I missed your message! Sweet potatoes seem to vary wildly in size (and therefore weight), and in Googling, the answer to this question was equally varied. It seems there was some consensus that 1 lb sweet potato yields 2 cups mashed. This sounds about right–most pies need about 4 cups of filling to fill to the rim. Usually I pick up the 3lb sack of sweet potatoes from Trader Joe’s and just remove a couple. Hope this helps! Deep Dish Caramel Apple Pie #BakeForACure #SundaySupper | Mama.Mommy.Mom.